Did you know that in today's vehicles, the windshield in engineered to be an integral part of the overall strength of the vehicle's passenger compartment. While many times windshield chips can be safely repaired, it is not always the best option. When it comes to the safety of you and your family, look to the experts. The GlassPro® Certified Technicians at Frontier Auto Glass have the experience to determine whether a crack or chip can be safely repaired. Frontier Glass has been serving the Buffalo and WNY area for over 90 years. 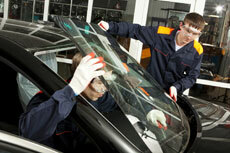 We provide full-service auto glass replacement for any vehicle, foreign or domestic. With a large inventory of glass, both new and used, Frontier Glass is able to provide same-day service for any of your auto glass replacement or repair needs. From motorhomes and tractors to cars, trucks, SUVs and minivans, our auto glass services are efficient and fast. Frontier Glass offers in-shop and mobile service. From windshields and windows to back lights, door glass or quarter glass, we offer all types of auto glass services and even process the insurance claim for you when necessary. Frontier Glass proudly carries Pilkington, PGW, Carlite®, and Mopar® products. It is not uncommon for glass to become chipped or damaged, especially car windshields. Frontier Glass offers repair services to help remove cracks and repair chipped glass. Using a resin to complete repairs, we are able to fill in chips or cracks, returning the glass to its former strength and providing you with the visibility you need. Available for same day service, chip repair takes approximately 20 minutes to complete. WE HAD 2 THERMOPANES REPLACED IN OUR HOME IN LOCKPORT AND WHAT A GREAT JOB STEVE AND THE GUYS DID. VERY PROFESSIONAL, MY HOME LOOKED CLEANER THAN BEFORE THEY STARTED. 10 OUT OF 10 SUPER JOB THANK YOU .